Zitron Trekking Handart Colombo (75% wool/25%polyamide nylon/100 g/420 m) and Drops Alpaca (100% Alpaca/50 g/180m). Toe-up (Magic Cast-on technique by Judy Becker). 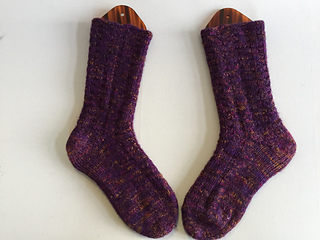 Short Row Heel. One Skein Zitron Trekking together with 2 skeins of Drops Alpaca is enough is enough to make one pair. One thread from both types of wool are knitted together.